Missy Elliott, an instructor, leads a class at Echelon Studio Wednesday, January 9, 2019 in Chattanooga, Tennessee. While there was one attendees physically in the class, there were several others tuning in through an application as they worked out in other locations. Attendees through the application can be seen on the screen in the upper lefthand corner. Four rows of bikes, about 40 in all, line the new cycling studio inside the historic Chattanooga Choo Choo. Colorful lights swivel throughout, pulsating to the music as a spin instructor shouts instructions to a nearly empty room. One lone participant pedals on-location for the noon Wednesday class — though they are far from being alone. Behind the instructor, two screens face forward, making it apparent the company is playing a different game than other spin classes in town. Techs in the back of the room monitor video feeds, lighting and sound. Names and faces pop up on the screen as the class begins — customers from across the world. Fifteen profiles rank on the leaderboard as participants, including that "lone" Chattanooga cyclist, pedal through class, calculating their resistance and speed on their home Echelon bikes. This is the focus of Echelon's business model. The new local company sells its state-of-the-art stationary bikes on QVC, in retail stores, at its cycling facilities and online. Since launching in 2017, more than 46,000 people have downloaded its app and approximately 6,500 are paying subscribers. 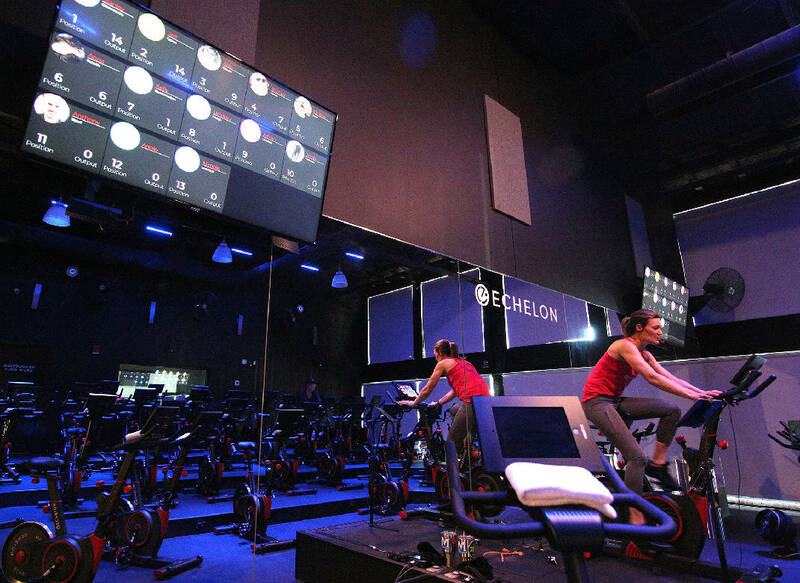 Echelon is billed as a cheaper alternative to the popular Peloton bike, which sells a similar service at nearly twice the upfront cost. Peloton's product comes with a mounted screen to display the classes. Echelon cut out the screen and has users use their own devices to save on cost. Echelon has had more than 500 people visit the downtown location since it moved into the renovated Chattanooga Choo Choo in November from a temporary location at parent company Viatek, another locally based business, according to the company's director of content and talent, Nancy McCaffrey. Viatek President Lou Lentine invented the bike and helped launch Echelon. Get Out caught up with McCaffrey to ask about the new facility and how business is going. Get Out: How have things gone since the move? Nancy McCaffrey: Excellent. We have gotten great response. People are excited to see something like this in this area of town. It's a super-fun location where they can drop in for a class, and then also take a shower and go out to dinner afterwards. There's all these other fun things to do in this area, so it's more a destination location. GO: What's been different being here compared to the temporary location? NM: Well, we finally have live students. We've been filming for a year in a small studio for the app that we developed, but just filming to the camera for our app users. It's been really energizing to have live students in class and to be able to teach our live students as well as our existing customers. GO: How has growth been with live students? NM: Great; steady; growing, especially now that the new year has started and those New Year's resolutions have kicked in. We're a great option to stay motivated with those resolutions because we offer so many different types of exercises. (Echelon also offers yoga and fitness classes.) We are open for classes at so many different hours of the day, which is great. GO: How has having an online base been able to allow you to have more hours, better hours and more classes? NM: What seems like a weird time to hold a class here — early afternoon — is a great time out in California, so no matter what time of day it is, it's always a good time for a cycle class with our customers. So we do offer some of those off-hour times for free here at the studio, because we have to teach those classes anyway to our app studio. GO: What made you all decide on this location? NM: When we air live, it's really cool to say "Live from the Chattanooga Choo Choo." Most people know what that is, and we wanted to feature Chattanooga in our app as a hot city to live — an up-and-coming, cool city. It's more fun to say we are live in Chattanooga than live in a strip mall somewhere. GO: I know this is locally based, but how many of the employees are here in Chattanooga? NM: For Echelon, we are all Chattanooga-based, minus our app developers and some support team in Florida. GO: What kind of growth have you seen? NM: Right off the bat we got lots of feedback. We did a VIP pre-opening special for, what we call, Very Important Pedalers. We have, I think, about 40 of those to date. They get all sorts of benefits: pre-class sign-ups, no cancellation fees, and we're going to start offering those members free parking, which is great. Then we've had considerable growth through other options such as drop-ins or class packages. We offer specials at our studio. We are also featured on GroupOn. GO: Are there any retail locations yet? I know when we talked last, there was some work to get into retail. NM: We sell here. We sell the Connect Bike here and another product, the Flex Bike — which is a recumbent-style bike — here. We're also now in Academy Sports, Sam's Club, Johnson Fitness, BJ's [Wholesale Club] and online-only for Sharper Image. We also sold on QVC and sell on Amazon. GO: This was originally seen as a lower-cost alternative to Peloton, right? Can you take me through that decision? NM: We wanted it to be something a wider span of customers could afford. We're less than half the cost [of Peloton], so we figured we could hit a wider consumer base. We're getting a lot of great feedback on the price point. I think people are excited that this is an affordable way to get into an online fitness community. GO: Is there anything else you'd like to add? NM: I want to mention what makes our classes different. Our instructors are such real, likable people. Our classes are very relatable; more tuning in to the common person. We all teach these classes because we love it. We have other jobs. We do this for a passion.